How do you help your students explore and enjoy the magic of the holidays? Do you read The Polar Express by Chris Van Allsburg? Do you watch the movie? 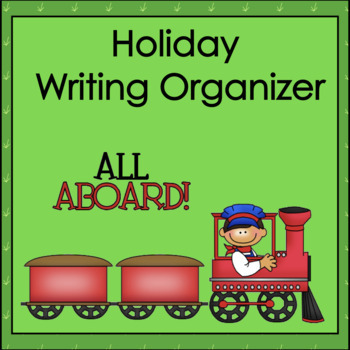 The Polar Express is the inspiration for this writing activity. 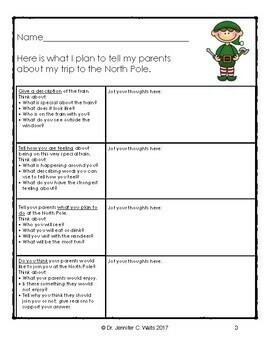 This ready to use immediately project gets kids excited about writing and engaging with their own thoughts and feelings; it is one of my favorite activities during the holidays! 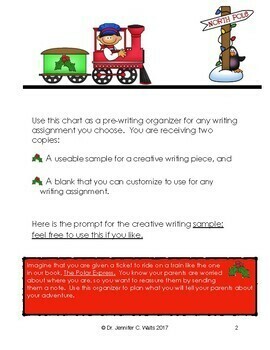 In addition to the Polar Express writing activity, I have included blank templates so that you can customize the project for your students in any way you choose. In this packet you have 1) a prompt, 2) a writing organizer to get your students thinking about what they will write, 3) writing paper, and 4) a self-check list for students to use before they turn in their work. 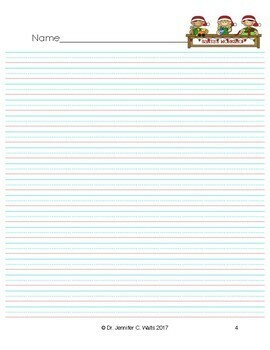 NOTE: The writing paper included is specifically intended to help encourage better penmanship; I always struggle to get kids writing neatly. If you have the technical capability, students may type their responses. I am so happy that you have found your way to Chalk Dust and Apples! Please follow me and leave feedback so that I can continue to improve and meet your needs. In the meantime, have the happiest of holidays; remember to take advantage of seeing the magic through the eyes of your children.